“Graffiti Girls” is a stunningly beautiful portrait series by Austin TX-based artist Kevin Peterson. His blend of both hyper realistic portraiture and natural graffiti penmanship is a new one, and his command of both styles is impressive. 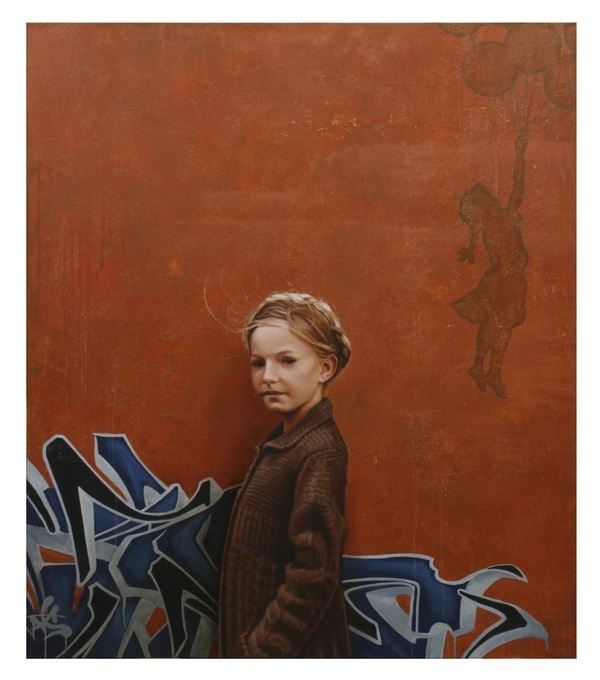 Peterson uses the rough and jagged shapes of wall tags to directly juxtapose the soft beauty of young girls; the ragged and worn versus the innocent and clean. Though subject and backdrop are polar opposites, the girls seem empowered by the art behind them, instead of shying away from it. They may live in a world that’s tagged up, but they aren’t scared of it. The color and design of the spraypaint behind them seems to enhance the girls’ beauty and personalities, especially with Peterson often coordinating the tags with the girls’ outfits. These portraits help to make the argument that graffiti is becoming a more normalized form of public art, and though it’s not always pretty, younger generations growing up in this world are used to its presence, instead of threatened by it. I find this series disconcertingly racialized and I’m trying to parse the statement being made about class. I can hardly ignore the implications of young, fresh-faced, mostly blonde girls in pretty clothes looking like fashion ads for Gap Kids in front of urban, “ghetto” settings. It’s not possible to view these paintings without an uncomfortable feeling that the artist either desperately needs to check their own racial views or examine more deeply what it means to position “desirable’ young white girls in front of an art form that is predominantly used by men of colour.